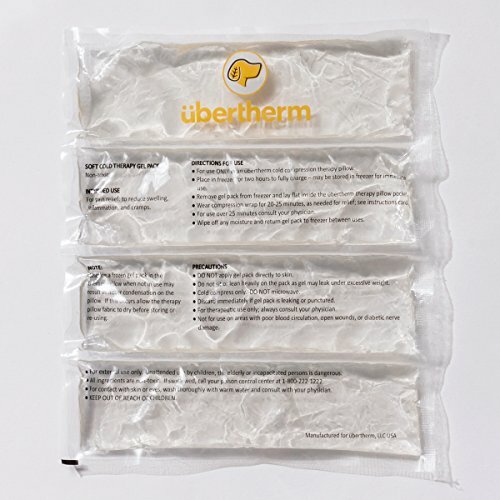 übertherm Cold Gel Pack for use ONLY in an übertherm SHOULDER Pain Relief Cold Compression Wrap. Gel pack should NEVER be applied directly to the skin. For additional freezer storage only. For use ONLY in an übertherm SHOULDER Cold Compression Wrap. Non-toxic BPA-free, Phthalate-free, cold gel. For external use only. NOT FOR DIRECT-TO-SKIN USE -- Keep away from children. View More In Hot & Cold Therapy. If you have any questions about this product by übertherm, contact us by completing and submitting the form below. If you are looking for a specif part number, please include it with your message. Compression Gel Wrap For HAND & WRIST Pain Relief. Reusable Cyro Cold Therapy Is Colder Than Ice For Long Lasting Pain Relief From Spasms, Swelling And Sore Muscles. Consistent Temperature For Hours.